Body Tilting Action: When cornering, the figure leans dynamically in the respective direction. Auto OFF Controls and cars switch off automatically after 30 minutes of standstill. 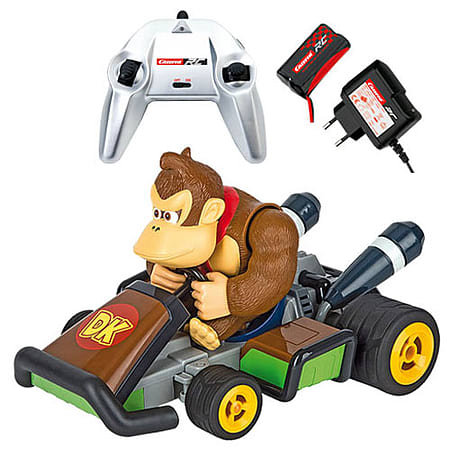 Fans can race around with the Carrera RC Donkey Kong Kart from the well-known Mario Kart TM 7 game at a top speed of up to 20 km/h. There's lots of ape-sized action during up to 40 minutes of racing fun and a recharge break of only 80 minutes thanks to the powerful 7.4 V – 700 mAH Li-Ion battery. Whether speeding around sharp bends or performing daring stunts, the Servo Tronic Technology and differential gears provide excellent support for precise steering and control. Every minute with the remote controlled Donkey Kong is a joy. For authentic racing with friends there's 2.4 GHz Technology enabling up to 16 RC cars to compete against each other. The fun begins at the unpacking stage with this Ready to Run model. Put your foot to the floor and go ape! The boredom's over - now it's time for Donkey Kong!